Mama Peacock: I Heart Target! It was a Target day today, we had to buy snacks for E's Kindergarten class and get some socks for the kids (which begs the question; WHY do the kids never have enough socks?). Anyway, B was very excited about his new socks and was convinced that the bright white ones were glow-in-the-dark. There was no convincing him that they weren't~ he had to check it out himself and go downstairs in the dark. He was okay with it and we made a game of matching the socks. 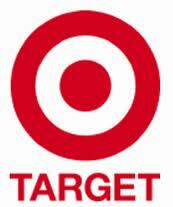 I am now the owner of a bright shiny Target card, did you know that you get 5% back EVERY time you use your Red Card? It makes up for the penny difference in prices between Walmart and Target. I would much rather shop at Target, Walmart just makes me SO crabby! I love that I can sign up for a portion to go to my kids' school and if you want you can even get it as a debit card right from your checking account! LOL I took dislike Wal-Mart and love Target. And my kids never have enough socks either! I've bought several packs for all 3 kids this year.